The British Museum is my favourite museum and one of the most renowned in the world (the latter is probably more impressive), so when it puts on a special exhibition, you know it’s going to be good. Its latest special exhibition is Hajj: journey to the heart of Islam. Pretty self explanatory, it’s the story of Hajj – its origins, what it is, why people do it, how people do it. The exhibition’s title is relevant on more than one level – Hajj is a pilgrammage, a journey itself; visitors are taken on a journey when they visit the exhibition (literally and figuratively), and the exhibition explores the journeys of those who have undertaken Hajj in years gone by, and how those journeys are undertaken now. The first part of the exhibition is dedicated to the story of the Hajj, and the journeys travellers from years gone by made to get to Saudi Arabia, from Africa, Asia, Europe and the Middle East. Most fascinating in this area were the stories of Europeans who made the pilgrammage. Of these, the one I was most interested in was Lady Evelyn Cobbold, who because the first British woman to undertake the Hajj in the early 1900s. Impressive artefacts include coverings for the Kabah, letters, books and tools used by pilgrims on the way to Hajj and a gorgeous Mahmal – a red silk tent of sorts which was used to symbolise the power of the sultan when his subjects went to Hajj. Moving into modern times there is a short video which uses extracts from a film made about the Hajj. This explains succinctly the rituals that make up the Hajj, and their origins, and shows pilgrims from modern times on the Hajj. Art has always been a big part of the Arabic world, and the exhibition shows the work of some modern artists who have made pieces inspired by the Hajj. Among my favourites was Ahmed Mater’s Magnetism, showing a tiny Kabah with pilgrims surrounding it – all the pilgrims are actually iron filings. Also moving was the print made from two lines of a poem written especially for the museum’s Hajj exhibition. One of the best things about the exhibition, aside from its way of explaining the Hajj in a clear, concise manner, is the range of artefacts gathered by the British Museum to showcase in it. Short films from the archive of the Imperial War Museum and Pathe sit alongside giant photographs, which hang next to glass cases containing Qurans that are centuries old, which lead the visitor to contemporary art created within the last year. The British Museum worked in partnership with the King Abdulaziz Public Library Riyadh to put on the exhibition, and has gathered pieces from its own collections and from collections across the world. If one of the best things is the collection of objects, then probably the best thing comes at the very end of the exhibition. There, visitors can listen to contemporary pilgrims describing what they felt when they went on Hajj. Their stories are moving, and a fitting way to end the exhibition. However public the Hajj, and however it is explained, it is only by hearing the intensely personal stories of pilgrims that you truly get a feel for how much it means to those of the Muslim faith. 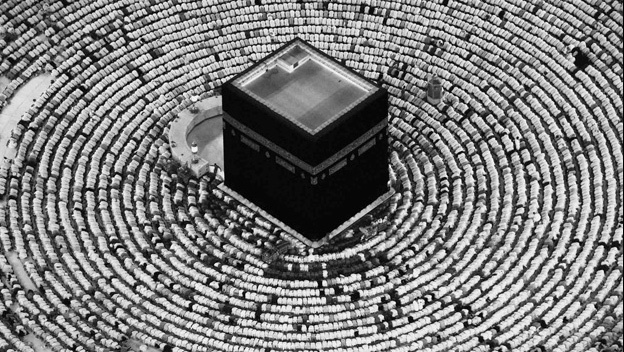 Hajj: journey to the heart of Islam is on at the British Museum until April 15. Visit www.britishmuseum.org for more information. kuran says god is formless and not there in hajj. Then why they go to hajj? Is it just because sentiment or any spiritual meaning is there?